Anyone who pays the slightest bit of attention to horror films (and everyone should) knows that the genre is dominated by trends and cycles. When something is popular, the copycats come out of the woodwork and a certain type of movie (zombies, vampires, slashers, etc.) will overtake the world of scary movies until something new comes along. Due to this, something which we don't see nearly enough of is the Southern Gothic movie. Filled with large, old house, family secrets, and thick accents, these movies often harken back to a simpler times when movies had a more deliberate pace. 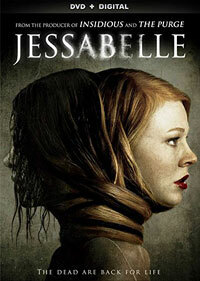 Jessabelle aims to revive this type of film, as it includes all of the requisite elements. But, does it bring the scares? As Jessabelle opens, Jess (Sarah Snook) and her boyfriend (Brian Hallisay) are about to move in together, when they involved in a horrific auto accident. Jess survives, but after two months of physical therapy, she is still unable to walk on her own. Confined to a wheelchair for the time being, Jess is forced to call her estranged father, Leon (David Andrews), for help. He takes her to his dilapidated house in the bayou, where Jess was raised. Bored and alone (as Leon is often out drinking), Jess discovers a box with her name on it, which contains videotapes. On these tapes is Jess’ mother, Kate (Joelle Carter), who addresses Jess while doing Tarot card readings. Following another tragedy, Jess runs into Preston (Mark Webber), her childhood sweetheart. Jess confesses to Preston that she thinks that her house is haunted and that it is somehow tied to what she heard from her mother on those tapes. The two begin to investigate and Jess soon learns that her family has many skeletons in the closet. But, while Jessabelle is faithful to its genre, there is still something missing from the film, namely something truly scary or creepy. Director Kevin Greutert, who has worked on many of the Saw films and directed the last two, and his team have certainly given the movie an authentic look, as we can practically smell the house through the screen, but the movie has trouble finding its way. The videos with Jess’ mom are somewhat interesting, and the scene in which Jess first encounters the thing haunting the house is certainly intense, but otherwise, Jessabelle is a bit dull. This occurs for three primary reasons. First of all, the story is all over the place, as it attempts to include Jess’ wreck, her reunion with her father, her reunion with Preston, ghosts, voodoo, jealousy, swamps, and an apparent love of VHS. The movie tries to tie it all together in the end, but it still feels like the movie has bitten off more than it can chew. Secondly, Sarah Snook isn’t very engaging in the lead role. I couldn’t quite put my finger on it, as Jess is written to be someone that we are supposed to like, but I simply didn’t care what happened to her. And third, it’s not the most well-known movie ever, but plenty of people have seen 2005’s Skeleton Key (which, despite Kate Hudson’s presence, is a pretty good movie) and Jessabelle will certainly remind them of that movie. As a native Southerner, I try to support Southern Gothics, and going in, I felt that Jessabelle had a lot of promise. And while it certainly tried to remain in line with the genre, in the end, the film is hampered by too many dull phases and an inability to truly grasp the viewer. The fact that it all feels very familiar doesn’t help. I applaud the movie for having the guts to feature a down-beat ending, but this certainly won’t improve most viewers feelings on the film as they walk away from it. People already think that life down South is slow and dull and this movie does nothing to counter that notion. Jessabelle offers a quick cameo from Alex Mack on DVD courtesy of Lionsgate. The film has been letterboxed at 1.78:1 and the transfer is enhanced for 16 x 9 TVs. The image is sharp and clear, showing no overt grain and no defects from the source materials. While this is an overall dark film, the colors look good and the image is never overly dark. The picture does look somewhat flat though, but the image is rarely soft. The DVD carries a Dolby Digital 5.1 audio track which provides clear dialogue and sound effects. The stereo effects are nicely done, most notably those which alert Jess to sounds coming from within the house. Likewise, these moments bring in notable surround sound. The subwoofer jumps into action during the "shock" moments. The Jessabelle DVD contains a handful of extras. We begin with an AUDIO COMMENTARY from Director Kevin Greutert, Writer Robert Ben Garant, and Executive Producer Jerry Jacobs. "Jessabelle: Deep in the Bayou" (9 minutes) is a brief featurette which contains comments from the actors and creative team. A good deal of time is spent describing the discovery and dressing of the main house. There is also a discussion of the challenges of the location shooting in North Carolina. The authenticity of the atmosphere is discussed, as are the actors and director. The DVD contains seven DELETED SCENES which run about 8 minutes. This includes a discarded opening credits sequence which would have given too much away, an extended version of the crash, and a dream sequence which also had too many clues. The "Extended Ending" is just a few seconds longer and has no new information. The final extra is a 3-minute reel of OUTTAKES.